I have some exciting and important announcements to make. 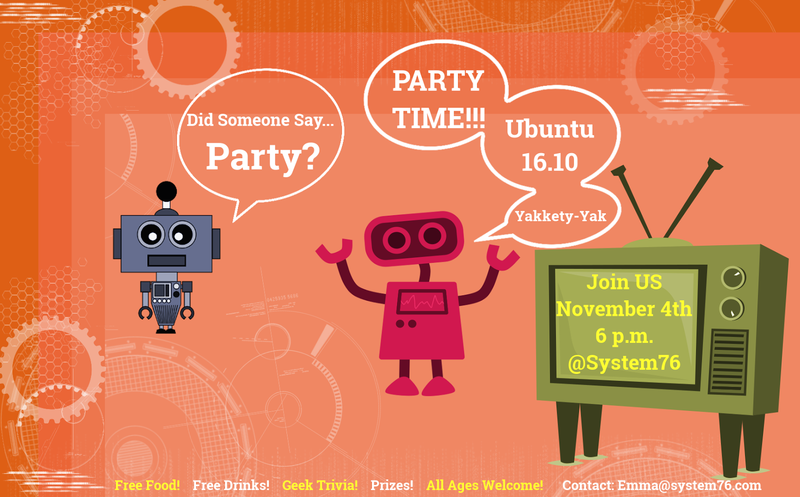 Ubuntu 16.10 is coming out this week and that calls for a release party for the Colorado Ubuntu Group. Guess who sponsors the local Ubuntu group... SYSTEM76. So, you know we're going to have an awesome set-up. Mostly because I'M planning it :) J/K (sort of). There were so MANY people at the April release and I anticipate at least 20 more for this one. Our parties aren't like other Loco Ubuntu parties... I try to make them as exciting, entertaining and as geeky as possible. But, I also love food, drinks and free stuff. So, someone like me organizing a party can- and has always- resulted in a GOOD TIME. If you're in Colorado, you're invited! We have a ridiculous amount of product updates. Most deal with nVidia 10-series GPUs, but the most highly-anticipated release for my personal customers is the RAM upgrade. You get up to 32 GB RAM @ 2400 Mhz on our mainstream System76 Laptops. Are you serious? Yes. We are serious at System76. I dare you to find something comparable to our laptops with Linux working out of the box at the same price. It's just too hard. So, I'll be happy to make it easy for you because I can tell you what you need if you just talk to me. Phone, chat or e-mail, just get in touch with me. It sounds cheesy, but I don't work on commission, so I'm definitely here to provide the RIGHT solution for you or your family. If you can't convince them to switch to Linux-Ubuntu... I will. I'm on a switching frenzy when it comes to Ubuntu, so, I'm sorry if I rant. I can't stop switching people from Windows to Ubuntu and it's kind of a big deal. To me. We always have tons of pics and experiences from conferences, but this time, with Ryan as our lead, we'll have more than just pics. It's exciting. It's going to be a completely different social experience and work enviornment with someone new, but the only thing it can be is EXCITING. So, I can't imagine anything that can go wrong. Feel free to ping me @socialhappiness on Twitter bc I'll chat with you any hour that I'm awake- no matter the subject.